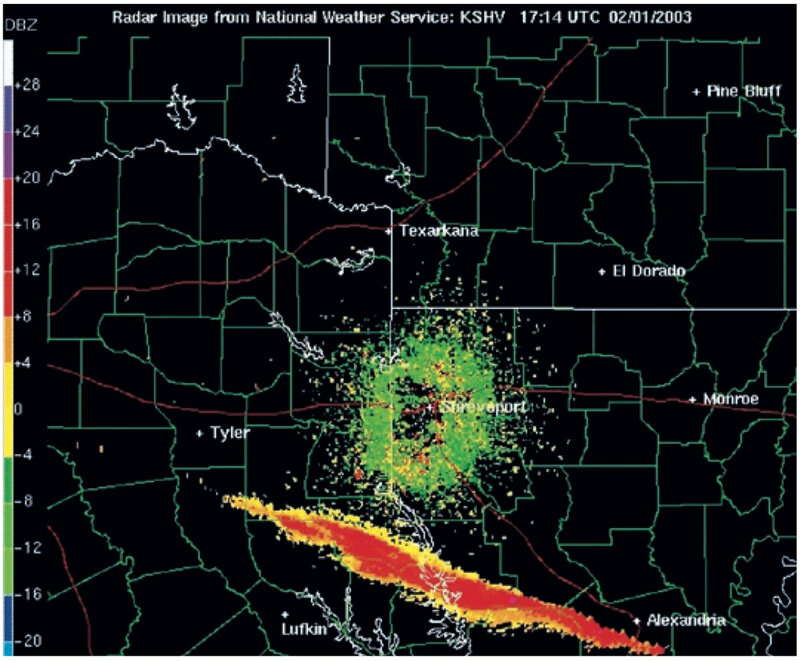 An international group of researchers is developing an unusual forecasting tool – a program that would be able to predict where and when a meteorite or a reentering satellite could hit an aircraft. As fictional as it may sound, the risk of an object from space striking a commercial airliner while hurtling through the atmosphere, though slim, is realistic and capable of producing the most catastrophic consequences. Being well aware that even the least probable of possibilities can sometimes become a reality (such as aircraft disappearing under mysterious circumstances), a team of experts led by the International Association for the Advancement of Space Safety (IAASS) has launched a project called ADMIRE for Aviation – (Space) Debris and Meteorites Integrated Risk Evaluation. Its goal is to make space debris and meteorite forecasting an integral part of aviation safety procedures, similar to detailed weather information. Dimensions of airspace affected by a spacecraft reentry event. The risk posed by space debris and meteorites to air traffic is generally perceived to be very low, therefore there have been few attempts to properly quantify it. However, there have been moments when major tragedy was avoided by no more than sheer luck. On December 19, 1996, a Chinese passenger plane was forced to make an emergency landing after the exterior glass of the cockpit window was cracked by an unidentified flying object at an altitude of 9,600m. More recently, on March 27, 2007, an Airbus A340 of LAN Airlines spotted wreckage from what was thought to be the Russian Progress 23P cargo ship reentering the atmosphere. The aircraft, flying between Santiago, Chile, and Auckland, New Zealand, was carrying 270 passengers. The pilot estimated the debris was within 8km of the aircraft and reported hearing a sonic boom as it passed. Russian authorities dismissed the space debris hypothesis, instead blaming a meteorite. Either one could have been fatal. In fact, in the 40 minutes required for the majority of the debris from Space Shuttle Columbia to fall to the Earth’s surface, as many as nine civil aircraft flew through the falling debris. Although no damage to any of those aircraft was reported, a study conducted by ACTA, Inc. of Torrance, CA showed, using data retrieved from the accident investigation, that the probability of one of these aircraft being struck by a piece of falling debris could have been as high as 1 in 10 to 3 in 1,000. The analysis assumed, per current standards, that any impact anywhere on a commercial transport by debris of mass above 300 grams would produce a catastrophic accident: all people on- board would be killed. The Shuttle Columbia tragedy began at about 60km of altitude and led to a “progressive breakup” in which Columbia’s primary structural failure was followed by smaller pieces (thermal tiles, fragments of the cargo bay doors, etc.) continuing to shed off of larger pieces (landing gear, turbo pumps, etc.) during the fall. Large pieces were less susceptible to wind and drag, falling down quickly and reaching the ground within three to five minutes. Smaller pieces became instead entrained in the wind as they fell and some of them even developed a small amount of lift. As a result, these pieces took about 40 minutes to reach the ground. Although small and light, some of these pieces were large enough to substantially damage aircraft. Smaller pieces, assumed to be harmless to aircraft, remained airborne for over two hours. 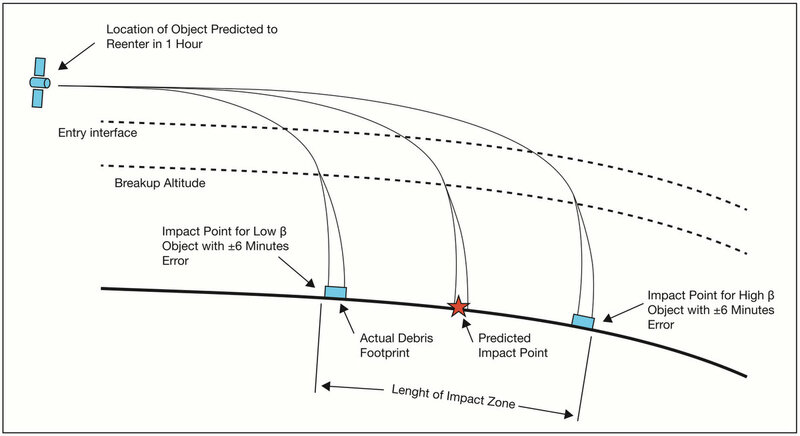 The Columbia accident highlighted the need to select vehicle reentry trajectories that minimize the risk to ground populations and the need to take measures to keep air traffic away from falling debris. Moreover, it started a chain of events that demonstrated the need for a deliberate, integrated, and international approach to public safety during reentry operations, particularly for the management of air traffic and space operations. Prior to this accident, neither the Federal Aviation Administration (FAA) nor NASA took active precautions to protect uninvolved aircraft from the potential hazards of Shuttle debris during a planned reentry. Following the Colombia accident, the FAA established procedures to be used as a real-time tactical tool in the event of a Columbia-like accident to identify how to redirect aircraft around space vehicle debris. The tool developed for the purpose was called Shuttle Hazard Area to Aircraft Calculator (SHAAC). 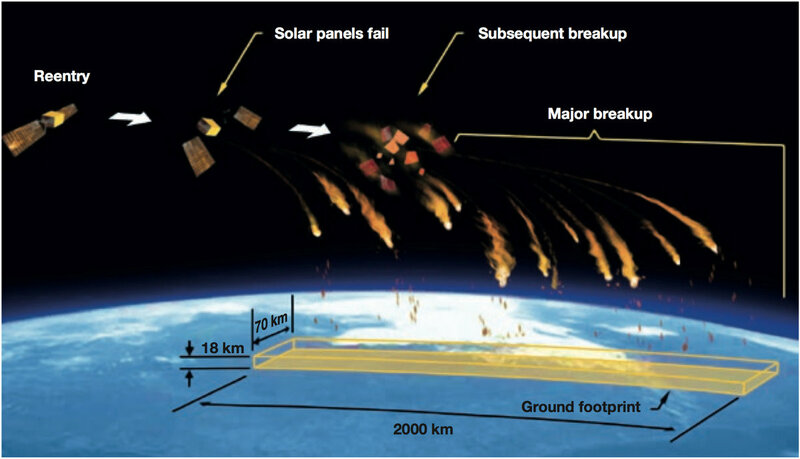 SHAAC used a simplified Shuttle debris catalog to predict the size and location of debris footprint providing information to define the airspace containing the falling fragments. Although the Shuttle retired from service in 2011, the lessons learned from Columbia disaster and the procedures developed for it can be reused for the increasing number of commercial space transportation systems that will carry out routine suborbital operations, launches to orbit, and orbital reentries in the coming years. Across this range of vehicles, the available reaction time between space vehicle breakup and entry of debris into the US National Air Space (NAS) can range from zero (if the vehicle is in the air traffic environment at the time of the failure) to upwards of 90 minutes (if the vehicle is nearly in space and at orbital speed at the time of failure). Air traffic operators will require dependable information and procedures to cope with the sudden onset of such an event and with the short lead-time that will be available until debris enters the airspace. To address those operational needs, FAA has been working on a systematic, standardized space vehicle debris threat management process that can be applied to the variety of space vehicles that will eventually operate in the NAS in the US. The procedures established after the Space Shuttle Columbia accident to clear the airspace in case of a space vehicle breakup are only feasible for controlled reentries such as those typically performed for crewed missions, or at the end of mission by cargo vehicles that carry spare parts, consumables, and other items to the International Space Station. In such cases, specific maneuvers are planned ei- ther to bring the vehicle intact to a preplanned location, at sea or on land, or to direct the debris field, following frag- mentation/explosion, away from inhabited areas, such as into the South Pacific Uninhabited Area. According to The Aerospace Corporation, there are about 100 large man-made space objects that reenter the Earth’s atmosphere randomly each year and then fragment and explode during the atmospheric descent. Forecasts of the time and location of such uncontrolled reentries may have errors of several thousand kilometers and are available only minutes before reentry. 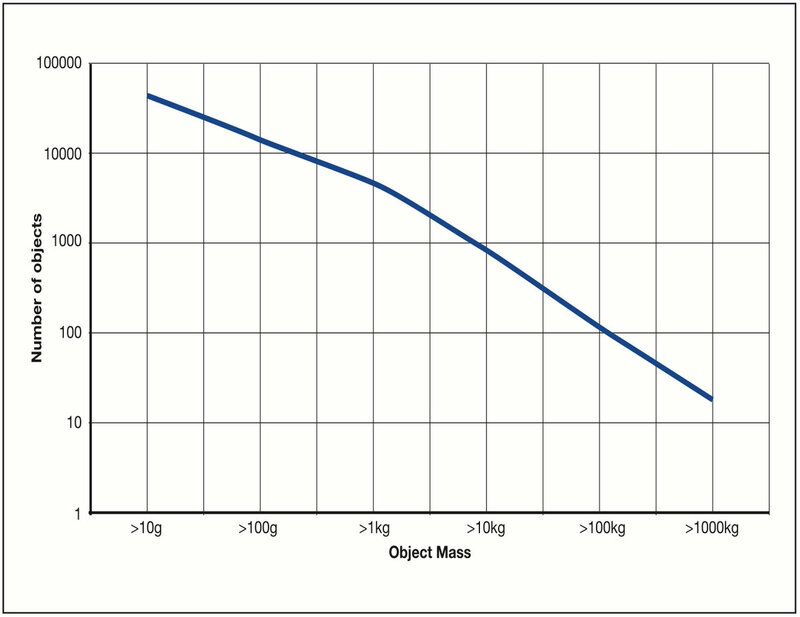 In addition to large objects, there are several thousand of smaller space debris, results of on-orbit fragmentations due to explosions or collisions that reenter annually. Very little is known about them in terms of further fragmentation or demise. Dr. Russell Patera of The Aerospace Corporation analyzed the risk from falling space debris to passengers aboard commercial aircraft using statistical data and information associated with different commercial aircraft. The analysis was carried out only for flights within, from, and to the US in 2006. Patera computed the risk for aircraft from a typical flux of space debris with a realistic distribution of inclinations; according to his estimation, the annual risk of collision for all US aviation traffic due to space debris is 3×10^-4. A range of natural and manmade debris populating the space around Earth periodically enters the atmosphere, representing a hidden source of risk for aviation. Due to the relative speed of these objects and aircraft construction, a collision between relatively small fragments and aircraft, although assumed very remote, has an intrinsically high poten- tial for multiple casualties. Although there are a number of methodologies and tools to assess the risk for the public on the ground due to a reentering space debris event, there is nothing available for assessing the risk to aviation from combined space debris and meteoroids fluxes. The annual risk for passengers due to an airplane being hit by reentering space debris or by a meteoroid has never been precisely quantified. Moreover, there are no methodologies for real-time risk assessment that can be used by air traffic control authorities and civil protection organizations to activate emergency plans for impending reentries. This is where IAASS, along with ACTA, Stanford University, Astos, HTG, French Space Agency CNES, the Paris Observatory, the Italian National Research Council, and Polytechnic University of Milano,comes in. These organizations partnered to develop an advanced tool that will enable assessment of the risk to aviation due to reentering space debris and meteorites. In short, ADMIRE will enable the evaluation of aviation risk not only on a single-event or annual basis but as an ongoing real-time assessment. The ADMIRE project has already aroused the interest of the FAA and of its European counterpart, Eurocontrol. After a year-long definition phase, it is ready to bid for US and EU funding. “The conceptual phase of the ADMIRE project is complete and we are ready to proceed with full development,” says Sgobba. 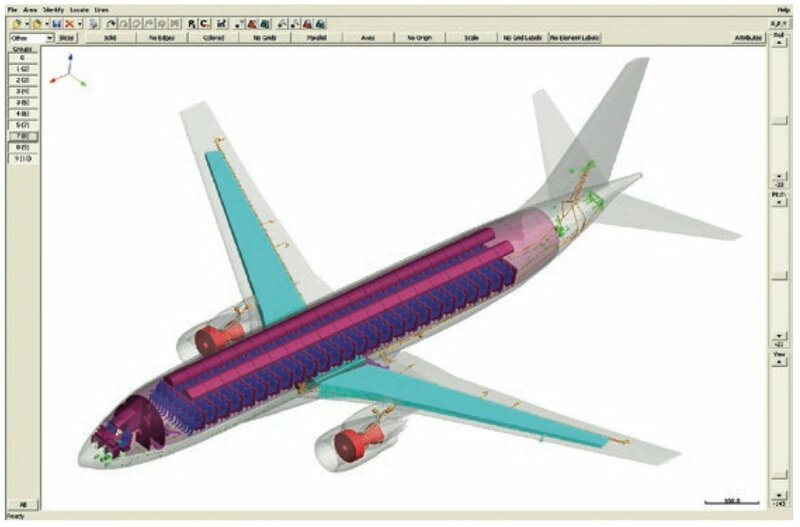 Computer model of a commercial transport aircraft used to assess debris impact. Courtesy of Paul Wilde, Ph.D., P.E. Specifically designed to estimate the annual integrated debris and meteorite impact risk to aviation for regions of highest air traffic, such as Europe, East and West US, China, and Japan, ADMIRE intends to provide specific vulnerability models to help aircraft manufacturers miti- gate the risk to aircraft in case of impact with a reentering object. Moreover, the determination of the total reentering flux could help insurance companies develop more accurate risk assessments for the aviation and liability of space assets. According to Sgobba, ADMIRE is also going to assess the compliance of new space systems with reentry safety requirements, taking into account densities and vulnerabilities of ground population and aviation traffic as separate factors. 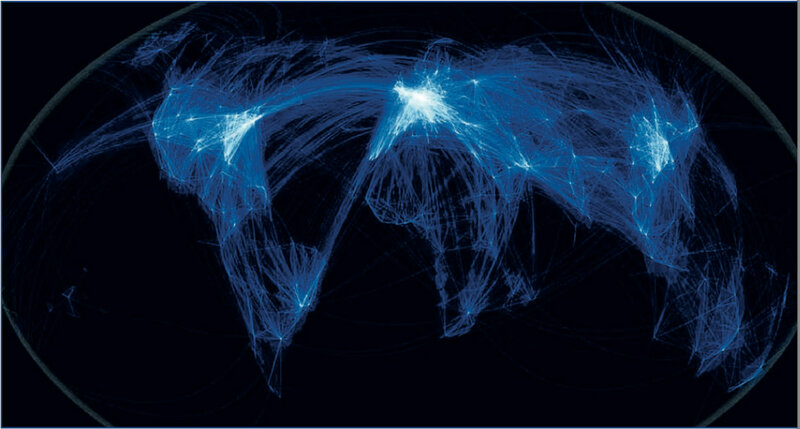 By integrating space debris reentry predictions with up-to-date aviation traffic density maps, ADMIRE can be expected to become a fundamental tool for civil protection and air traffic control authorities to make quick decisions for accident prevention.